The battle started off with great tension. Chris, the Russian commander, sought to clear lines of fire for his artillery, which was ordered to bombard immediately afterwards. 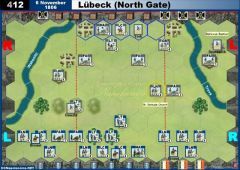 The French Guard Foot Artillery was shaken by this opening salvo, but Ney rallied the shocked gunners back to full fighting strength. 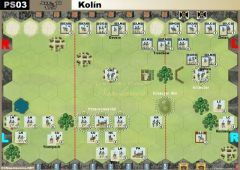 Ney then brought his Young Guard forward and opened what would turn out to be a lengthy shooting duel in the centre of the battlefield with various Russian units being cycled forward as their comrades suffered losses. 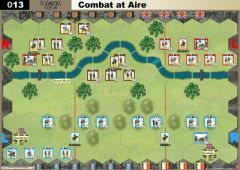 The first devastating blow of the battle occurred on the French right, however. After some initial maneuvering into place, Nansouty unleashed a Cavalry Charge with his Guard Heavy Cavalry as well as the nearby French Cuirassiers. Not without suffering some losses, the French troopers managed to destroy the Russian Horse Artillery and to severely weaken the Russian Heavy Cavalry unit in the sector. 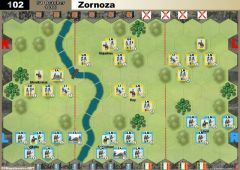 The Russians attempted a bold counter-charge on the subsequent turn, but Napoleon inspired his cavalrymen to strike first, weakening the impact of the Russian hussars. Immediately afterwards, the French cavalry routed all remaining Russian horsemen. Brave Wassilitchikow was not spared the slaughter. 0-4. The intensity of the battle dropped slightly after the tumultuous action on the French right. Both commanders maneuvered and fired in the centre. The French contested the area around Marchais after Russian advances in that sector. Meanwhile, the Russians checked the further advance of Ney's Young Guard. Accurate Russian musket and artillery fire, while holding, forced the Guardsmen into an ignoble retreat. * Once the Russians scored the first banner, Chris chose to withdraw as he could no longer win the two-legged match. I would to thank Chris for an action-packed bout. 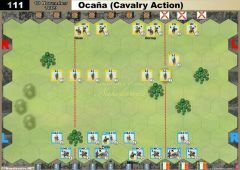 I had the great fortune of Cavalry Charge for the French, which is very powerful in this particular scenario. 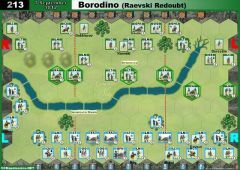 Overall, neither cards nor dice abandoned me, so I was quite fortunate, which quickly took away the tension for the second battle. All the best of luck in future battles to Chris. This was a battle fought from the flanks. 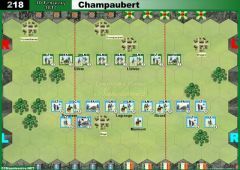 After a tentative opening, infantry were soon skirmishing on the French left whilst a cavalry melee developed on the right. Initially, the Russians had the worst of it but a daring, if foolhardy, breakthrough cavalry charge swept French Cuirassiers and Guard Foot Artillery from the field. The Russian Horse Artillery and (now spent) Light Cavalry made good their escapes having brought the balance of the battle back to parity. The sight of those Russian Horse Artillery firing on the move as they transversed the battlefield was too much for Marshal Ney to tolerate and, as the French rallied strongly across the field, he led the Young Guard forward to deliver skirmishing fire, with Guard Heavy Cavalry following up ominously. At this point, the battle started to develop quickly. 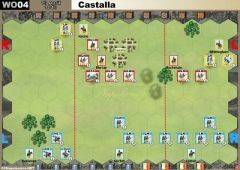 A force march from the Russian right flank yielded a banner to the Russians from ranged combat and placed the French left-centre under threat. Worse was to come; the Young Guard followed up their initial skirmishing success with a close combat attack on Russian Horse artillery, but the Russians were ready with "Canister". A reduced Young Guard could only dent the Russians and watch them ride away to comparative safety, both units weakened and vulnerable to further attacks. The Russians got in first with a mis-fired volley (forgot 2 dice! ), allowing Ney to limp away with a single Young Guard block to accompany him. 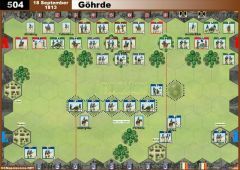 Next, the French Guard Heavy Cavalry charged home at last to scoop up the Russian Horse Artillery before it could escape and then put Russian Light infantry into square in the face of French artillery. The battle was now even again at 3-3 but the Young Guard had not yet escaped. 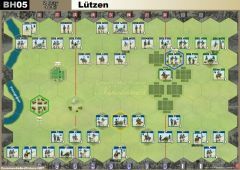 Whilst Russian infantry units forced the French cavalry back, another advanced and fired, finishing off the battered Young Guard, Ney's luck now also ran out; the only leader casualty, despite a high presence of French leaders in the thick of battle. Two more banners to the Russians. Ney's unlucky demise put the French under the pressure of time, the Russians just one banner short of Victory. The Old Guard are ordered forward to counter the Russian Line, but the Russians retreat and survive the onslaught (barely), leaving the Old Guard to face a strong defence. But, before that action could develop further, the cry of "sauve qui peut!" could be heard from the French left, as Russian skirmishers hit home on their umpteenth volley, sending their reduced counter-parts reeling from the battle-field and so yielding that final victory banner to the Russians. Thanks to Greg for a tense and challenging game. I look forward to the follow-up, scheduled for next weekend. Last edit: 2 weeks 2 days ago by RiverWanderer. Reason: Minor text edits. The Russians came forward from both flanks whilst the French artillery kept up an effective fire in the centre. 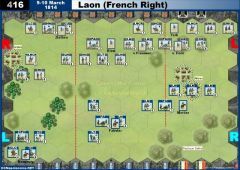 Refusing their left, the French engaged and pushed back the Russian cavalry and horse artillery on their right, gaining a threatening position on that flank. Now, the main Russian attack came from the French left and was countered with bayonet charge. 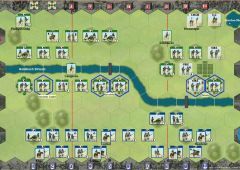 Furious exchanges followed in the centre of the battlefield, culminating in loss of the Old Guard unit but not before Russian attack had been stemmed and the French positioned to take victory with a final attack on the weakened Russian infantry. Thanks for Greg for another good game.